How to draw comics page layout. This is how I usually draw comics page thumbnails and page layout before I finalize the drawing. Step 1 thumbnails page layout story telling. How to draw Manga step by step. I personally like to layout story along with thumbnails pages, kind of like story board or box that show sequential art along with rough script. This is a sample of final comics page layout. At this stage, I just lay them out just for myself to know what’s going on in each panel. There is not yet appropriate action poses, environment, and composition within each box. My only concern at the moment is spontaneous story and continuous action or drama. I usually lay out about 3-4 of this little thumbnail pages at the time (in one session) so that it congruent with the continuous train of thought sequences. They are more like quick mark up scripts to me. **Looking at the vote, I can already see unanimous decision and “Shanghai Express” (to be renamed) is pretty much the winner. 24 Votes out of 29! 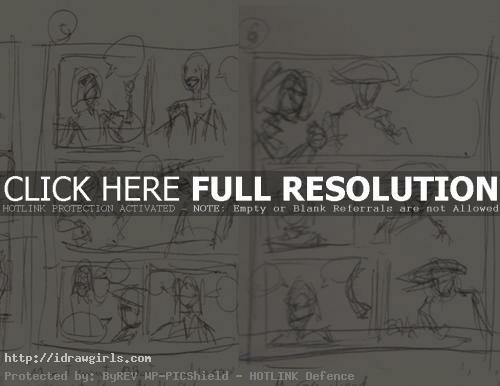 Here are thumbnails layout for page 3 and page 4 for “Shanghai Express” *temporary name. Here is the first thumbnail page to get the idea out. Glad they are helpful. You are most welcome. Cheers! Hi! This is Ayame Chise.